Apple Jalebi Recipe | How To Make apple jalebi | Cook Click N Devour!!! Apples go very well with Indian sweet recipes and this apple jalebi was also an absolute winner. apple flavor very well complimented saffron and cardamom powder. I have used the exact recipe as mentioned though you can use regular jalebi batter too for this recipe. 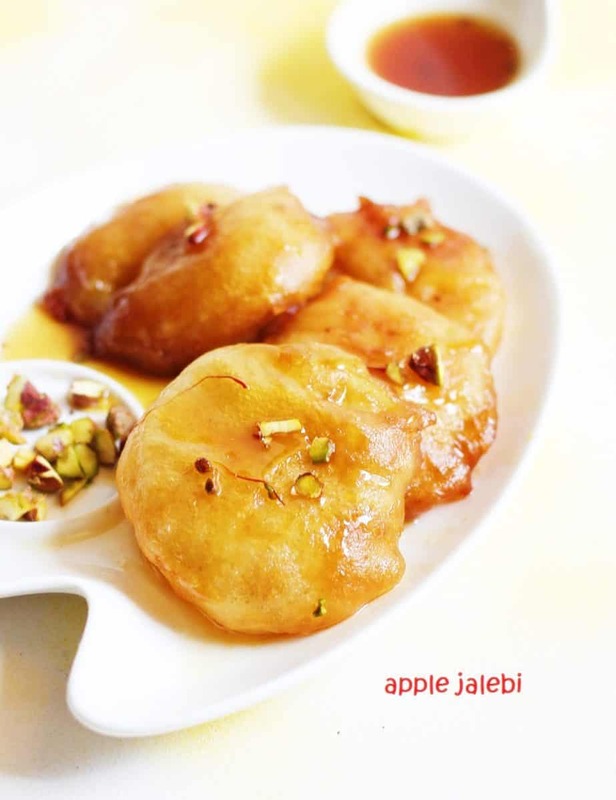 To make apple jalebi recipe yeast is used in batter for fermentation. if you prefer you can ferment the batter naturally as in traditional jalebi recipe. You can even try using jangri batter for this sweet. Serve apple jalebi warm or chilled as per preference. if you are looking for more easy diwali sweet recipes do check rasmalai, gulab jamun, besan ladoo, coconut ladoo, dodha barfi recipes. how to make apple jalebi recipe with step by step photos. Lovely innovative sweet. jalebi with apples sound yuumy.